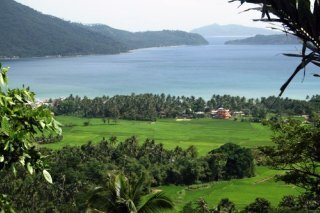 Instead of letting Philippine developers decide 'what is best for overseas retirees', a small group of expats decided to take matters into their own hands and are now developing a complete island (Tablas) to make it the Philippines' first 'expat focused' retirement paradise. The 'brains' behind this adventure are Chris Bech and Will Irwin; both married to Filipinas and with a combined business-experience of over 50 years. Chris already bought, developed, built homes and sold a total of 80 hectares to about 100 retirees from different nationalities. - Assistance with visa, driving license, healthcare, insurance etc. - A 'zero waste, zero pollution policy' to safeguard the environment. Anyone who joins the group can supplement their pension through an investment project already in place at Tablas; a 130 hectare organic farm with a very high ROI which is only possible thanks to the native pili nuts (export product). Their latest ongoing project (Sunset Beach Villas) on Tablas was initiated with the goal of providing a first class retirement community for 'foreigners' seeking an 'active' retirement community in the Philippines, one well within the budget limitation of a retiree on a pension. The group's decisions are based not only on their responsibility to investors, but also to the investment of their own personal funds in this project. They have contacts (and complete support) everywhere in both Philippine Government and private sector. Doors that stay closed for others, open for them. The reason why they selected the island of Tablas is obvious. Only 10 kilometer to the South, the 'number one tourist destination in the Philippines' (about one Million tourists per year) Boracay is located. Boracay is an exciting, 24-hour karaoke, bar and restaurant; cool place to be and to be seen (especially by the young). However, for a quiet, idyllic retirement spot within a limited retirement budget one has to look elsewhere. Tablas has the same beautiful beaches as Boracay, but at a fraction of the cost. The reason why Will and Chris have stepped up the pace and are 24/7 focused on their 'paradise' is because it is a matter of 'getting in on the ground floor'; owners of the most beautiful beachfronts and mountain views at Tablas are increasing their prices.